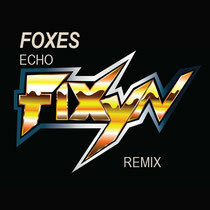 Los Angeles based production duo FIXYN is releasing their remix of the indie track by Foxes called ‘Echo’. The Southampton based songstress, Foxes, recently provided vocals on the title track of Zedd’s LP ‘Clarity’ and is rapidly growing into a musical force. With possibly one of the most beautiful voices in indie music today, Foxes have place their vocals on a canvas for electronic producers to work into EDM. FIXYN has properly transported these vocals into the electronic music world by giving it the upbeat edge and hard-hitting twist it deserves. Their official remix for Foxes is available for free download on their Soundcloud page. FIXYN takes these vocals and transforms ‘Echo’ into bassy piece, utilizing deep synths and infectious wobble sounds, creating a crossbreed between electro house and pop music. This catchy remix exemplifies FIXYN's ability to create electronic music that appeals to various music listeners.